In this hands-on workshop kids will explore different dried herbs, learn about their benefits and select their own blends to create pillows to encourage restful sleep and inspiring dreams. Registration and prepayment required as space is limited. Make your own fairy garden with herbs and learn all about the multi-layered benefits of these amazing plants. Make some magic. Reservations are required. Seating is limited. $65 includes all materials. Growing herbs is a great way to get kids excited about gardening. This hands-on workshop (suitable for all ages, 5 years and up) will teach participants about different herbs and how to grow and care for them. All participants will plant their own herbs and go home with everything they need to begin their own garden. Create an herbal first aid kit with medicinal teas, herbal steams, herbal compresses and poultices. Learn about plants, herbs and oild that can be used for specific injuries and illnesses. Participants will make and take home a healing salve. Seating is limited. $65 includes all materials. Reservations by phone or email. Does your child love to play with plants and flowers? Our herbalist will guide you to create your own flower crown, wand or other creation. For children ages 5 years and older. All materials provided. Join us for an afternoon garden tea party, featuring herb teas and herbal infused delicacies like Lavender Shortbread cookies. Hats encouraged! Hands-on workshop.. Space limited.$65 includes all materials. Reserve by phone or email. Does your child love to play with plants and flowers? Our herbalist will guide you to create your own flower crown and wand, perfect for any magical occasion. Be inspired by the bounty of flowers, foliage, ribbons and embellishments. For children ages 5 years and older. All materials provided. The art of creating beautiful potscapes. Join famed horticulturist, Allan Armitage, for a walk and talk through our gardens. The recipient of numerous awards, including the Medal of Honor from the Garden Club of America and the National Educator Award from the American Horticultural Society, he was honored with a Quill and Trowel award from the Garden Writers Association of America, and Greenhouse Grower magazine named him one of the ten most influential people or organizations — ever — in the floriculture industry for "encouraging growers to expand their markets with new annuals, cut flowers, and perennials." Born and raised in Quebec and Ontario, he later lived in East Lansing, MI and now resides in Athens, GA. He has worked with landscape plants and greenhouse crops in the North and South, and travels the world speaking and sharing his passion for plants. Armitage holds his B.Sc from McGill University in Montreal, his M.Sc. from University of Guelph, and his Ph.D. from Michigan State University. Allan has written 17 books, countless academic papers and hundreds of articles for both professional and weekend gardeners alike; including a monthly column in the national greenhouse publication, Greenhouse Grower for over 30 years. To view informative, and instructional short videos filmed in his personal garden, visit his YouTube channel. Widely regarded as an expert on perennials, Allan Armitage will help us celebrate National Pollinator week with a talk on how to select plants and create gardens to attract pollinators. Due to the weather forecast we are cancelling the egg hunt. The Easter Bunny came though, so join us in the store for candy and decorated eggs you can hide with your family when the sun comes out. This workshop presents easy ways to utilize the amazing benefits of beeswax. We will learn how the bees create the wax and what they need it for. Kids will make their own beeswax sculpture and lip balm to take home. Reservations are required. Seating is limited. $25 includes all materials. Do want to do your cleaning the natural way? Join us to learn to make cleaning products without harsh chemicals or toxins. Using essential oils and natural ingredients you will make various cleaning products to take home. Class includes instruction, recipes and all materials. Participants will learn the traditional melt and pour process of soap making. By combining various herbs, butters and essential oils, each participant will make their own natural glycerin soaps to take home. Here is an opportunity to bring botanical flavors and remedies from your garden into your kitchen. Participants will learn the historic use of herbs and basic methods of extraction, and how to preserve your harvest by creating herbal syrups. Each participant will make their own syrup to take home. Join us for a concert by the talented East End Youth Quartet. Refreshments will be served. No reservations required but seating is limited. Learn the traditional art of creating herbal infused oils and transforming them into topical solves for your personal needs. Participants will learn two methods of infusing herbal oils. Participants will create a personal herbal oil blend and prepare a healing salve using a combination of herbal oils, butters, and natural beeswax. Participants will go home with both an herbal oil and a medicinal salve. For the animal enthusiast! Learn how to use herbs and plants from your garden and landscape to support your pet’s health. In this class participants will create a pet-friendly salve for paws, wounds, bites and rashes. Topics will cover herbal health support for your pet; flower essences for animals, and herbs and plants for a natural flea and insect repellent. Participants will take with them both a salve and an herbal insect repellent. Diesel & Small Engine Mechanics, Landscape/Property Care Laborers & Foremen, Project Estimators, Heavy Equipment Fleet Manager, Equipment Operators, Welders, CDL A-B-C Drivers, Retail Salespeople, IT, Receiving. By popular demand - our Herb Thyme for Kids series is continuing. Kids will learn about some of the many things they can do with herbs from their own garden. During class, we will use infused flower oils, butters and beeswax to make their own herbal lip balm to take home. Creating your own natural cosmetics and skin care products is a fun way to enjoy herbs in your everyday life. Class time will demonstrate herbal facials, herbal bathing, creating body oils specific for skin type and together we will make an herbal body oil using pure essential oils and flower essences that participants will get to take with them. Growing herbs is a great way to get kids excited about gardening. This hands-on workshop (suitable for all ages, 5 years and up) will teach participants about different herbs and how to grow and care for them. All participants will plant their own herb seeds and go home with everything they need to begin their own garden. Experience the traditional art of herbal first aid. Be inspired to create your own herbal first aid kit. In this hands-on and informative class, we will prepare and taste medicinal teas, demonstrate herbal steams, herbal compresses and poultices. We will cover plants, herbs and oils that can be used for specific injuries and situations. Participants will make and take home an all-purpose healing salve that we will create together in class. A hands on workshop suitable for all ages (5 years and up). Participants will learn to identify and use specific plants in traditional and historic ways, taste and make their own herbal beverages. Todos son bienvenidos, Conozca nuestro equipo, Entrevistas Abiertas. 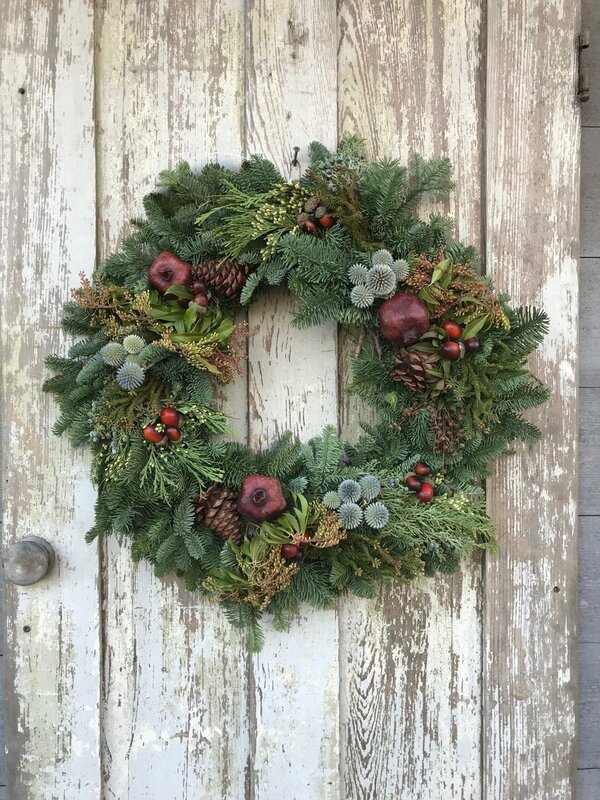 Join us as we guide you in making a beautiful wreath to decorate your home. All materials provided. $65 adults, $55 children. Reservations and payment in advance is required. Our friend Lil’ Bee will be buzzing around 11-3 on Saturday and Sunday. Find her and get your picture taken. We’ve added new items and new discounts in our sale tent. Antiques, furniture, gifts, planters and more. Join us as we guide you in making a beautiful wreath to decorate your home. All materials provided. $65 adults, $55 children. Reservations and payment in advance required. Enjoy a first look at our holiday decorations and enjoy our signature botanical cocktail. Consonance String Quartet will play a selection of classical pieces, including Vivaldi’s The Four Seasons.